Nigerian armies have put an end, in surprise attack, three unidentified key commanders of Boko Haram at Warawara general area of Borno, with their enclave also destroyed. 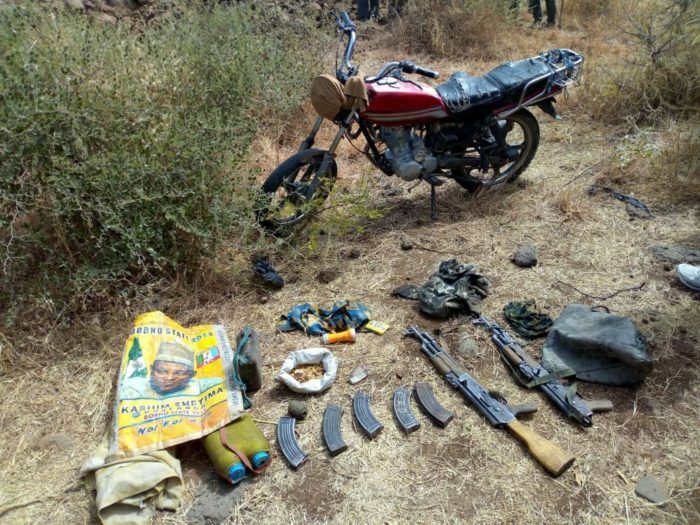 According to, the Acting Director Army Public Relations Col. Sagir Musa, two AK 47 Rifles, five AK 47 Magazines, Assorted Charms and one motorcycle were seized from them. The triumph came as Boko Haram terrorists sneaked into Maiduguri on Saturday morning to cause some havoc, NAN report. According to acting army spokesman, Colonel Sagir Musa, the insurgents, using Person Borne Improvised Explosive Device (PBIED) struck at Jidimari community in Jidari Polo area of Jere Local Government Area of Borno State. “Unfortunately, 4 innocent civilians lost their lives as a result of terrorists gun fire in addition to lethal explosion arising from PBIED mainly targeted at a mosque at a prime time of early morning prayers. “At the moment, troops have dominated the area, cordon and search as well as exploitation are concurrently ongoing. “Situation in the area is now calm. Normal routine activities are gradually going on. The army wishes to reiterate its resolve to ending the remnant of boko haram criminals thereby bringing an effective and an enduring end to terrorism and insurgency in Nigeria”.